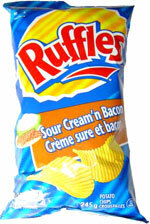 Taste test: These chips have medium-width ripples and a creamy, sort of bacony flavoring. It doesn't taste bad, but it's not a great taste either. I'd much prefer a chip that just tastes like bacon, since actual bacon is just so delicious. One of our tasters didn't like them at all, just couldn't stand the flavor. Smell test: Smells like creamy bacon.